An interesting movie about a highschool kid in a terrible neighborhood, as long as the movie is about the kid and his friends, it’s a lot of fun, but when it puts him in situations like being a dealer, it goes a little off the rails. This is an entertaining film with an intriguing premise that just goes a little too far off the rails of what made it great, by its end. What we have here is the movie of a highschool senior in the hood, trying to get into college and realizing that he has no choice but to get involved in the drug trade. The scenes of this kid and his friends, just hanging out and being themselves are a lot of fun. So are the scenes of them going to places to figure out what to do with the drugs. But once they start taking initiative and getting into the game themselves, this movie becomes a whole other thing. It takes the tune of a drug dealing movie crossed with a heist film, and ends up miles away from where it began. 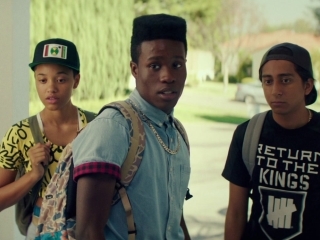 There is a ton to like about this movie, including a fantastic hip hop from the nineties soundtrack, but it just gets a little too far away from what was making it so special. 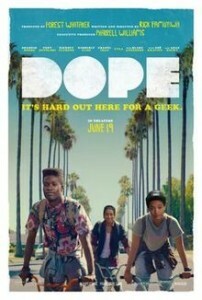 Dope is a pretty good movie with great characters and an intriguing premise. It’s the story of a highschool senior (Malcolm,) who is trying to figure out what to do with getting into college, and gets involved in the drug trade. Malcolm is a straight A student who happens to live in the worst part of L.A. He lives in an area known as “the bottoms,” which is such a mix of the projects and the hood, that he can’t even ride his bike down the street without running into trouble. His friends are Jib and Diggy. Jib is a kid who is mostly Iranian, but is about one-fourth African American. Diggy is a girl who hangs out with them, and has a real problem with white people using the N word. The three of them love nineties rap music and defend it to no end. Especially Malcolm. Early on he writes an essay for college all about Ice Cube in the nineties. Then later, he gets into a debate with an older kid, where he explains why the nineties were the most influential time for rap and hip hop. These kids ride to record stores and browse the selection, looking for some of their favorite artists and albums they never heard. What’s funny is that the nineties were at least a full decade before these kids were alive, so they never heard the music when it originally came out. Aside from his taste in music and pop culture, Malcolm is a unique kid. He’s got the grades, but he’s also got the guts and arrogance. He tells his advisor that he wants to get into Harvard and his advisor laughs. He says that a school like Harvard will never take his straight As seriously because of the neighborhood and school where Malcolm is getting them in. A school like this has to have some kids getting As, and considering the population Malcolm is up against, his As would mean nothing compared to those of kids from really good schools. On top of that, Macolm’s essay is about Ice Cube, whereas the advisor and school are looking for something more personal, such as an essay about his upbringing are struggles being accademically successful while living in the hood. All of this is pretty interesting and unique. We don’t get too many movies about highschool kids, whose biggest problems are getting into a college. And all of the pop culture references to the rap music of the nineties, and songs that we get to hear such as Jump Around, What’s The Scenario, and Slam by Onyx, are great. Malcolm is bullied by kids in the neighborhood and also kids in school who try to steal his sneakers. Everything seems like this will be a movie that finds its own niche, and then it starts turning into a movie about the drug trade. Luckily the film still takes a little time to get there, showing us an older kid who asks Malcolm to do him a favor and go over and talk to a girl for him. The older kid, Dom, wants Malcolm to invite this girl, Nakia, to his birthday party. She is studying for her GED, and Malcolm offers to help her study and pass the test. She agrees to go to the party, but only if Malcolm can come to. And so we get to the night of the party, and Malcolm and his friends get in, (although dealing with the security guard becomes a big issue,) and this is where the drug raid happens. Dom is in a back room doing a drug deal with a guy for a whole lot of Molly. Another crew busts into the room and starts shooting the place up. The dealer that Dom is working with gets shot. Dom makes it out of the room, but then the police show up. He knows that there is no way he is leaving the scene with this bag full of drugs, and so Dom grabs Malcolm’s bag, which he spots on the floor, and stuffs all of the drugs into Malcolm’s bag. Then Malcolm takes the bag home, not realizing what’s in it, and goes to school the next day. Considering that this is the moment or event that really changes everything and launches the movie into new territory that will become the path of the rest of the film, there are a few too many convenient things happening here. First, that Dom will spot Malcolm’s bag on the floor like that. Second that Dom will be able to stuff the drugs into the bag without Malcolm noticing. Third that Malcolm will remember to take the bag, when clearly he was away from it during the police raid, and lastly, that Malcolm will be carrying this bag home and not notice the weight difference. The movie tries to cover some of these bases, such as Dom throwing the bag to Malcolm and telling him to take it, and Dom emptying something that was in it, before filling it with drugs, so that it will have the same weight, but c’mon. Dom is telling Malcolm to take the bag, and Malcolm isn’t suspicious? The rest of the movie is about Malcolm and the drugs. Now, at this point, the movie is still pretty cool. Malcolm gets a call from a dealer who wants the drugs and knows he has them. Then he gets a call from Dom who tells him not to give the drugs to the dealer and instead to go to the house of a guy named A.J. Malcolm and his friends go to A.J.’s house, which turns out to be a mansion, and start hanging out with his kids, killing time, waiting for A.J. to get home. They do a jam session with A.J.’s son, while his daughter, Lily, keeps parading around the house, trying to seduce Malcolm. Eventually all the kids leave besides Malcolm and Lily, and the two of them stay in the house together, to get it on. Things don’t go exactly as planned, and Lily ends up taking some of the drugs that Malcolm has in his bag, bringing them to the bathroom, and secretly taking them, Pulp Fiction, Uma Thurman style. All of this is entertaining. It’s fun watching a kid in a situation with people acting strange in a house, and having no idea what’s going to happen. And the other kids have an interesting run in with the drug dealers who are trying to get the product, while at a fast food restaurant. Malcolm makes it out of Lily’s house and to his college interview, where he learns that the man interviewing him is A.J., the same guy whose house he was just at. Malcolm and this man come to an arrangement about the drugs, where if Malcolm can sell them off, this guy will get him into Harvard. And that’s where the movie takes a turn and goes from pretty great to just the usual kind of routine. Malcolm becomes a drug dealer. He gets some help from a friend he once went to band camp with, and they setup a website where kids can use bit coins to buy drugs. At this point, the movie has become pretty routine, and almost like a heist film, showing the way that Malcolm’s friend breaks into places to steal codes, and frame certain people. Boy has this film changed and gotten pretty far away from how it began, about a kid just trying to live a normal life in the hood and get into college. I suppose the statement here is that you can’t live in a place like this and not get involved in the drug trade, no matter how hard you try. The second half just feels way too familiar, with the kids blackmailing people and things like that. The movie is good, but it definitely loses some of what made it great, as it goes on, and becomes similar to other films about the drug trade and the hood.